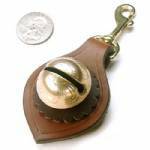 Our fob features an antique sleigh bell from the 1860s to 1920s era. The bell, about 1 1/4" across, is on a sturdy bridle-leather backing with a solid-brass snap. The fob can be snapped onto a ring of keys or used as a "bear bell" -- fasten it to your backpack, bicycle, or horse for safety when hiking or riding the trails. The sleigh bell will sound bright and clear, but the style may vary from that shown, depending on what is available in our current inventory. The bridle-leather fob is available in black, dark brown, or medium brown. View colors... 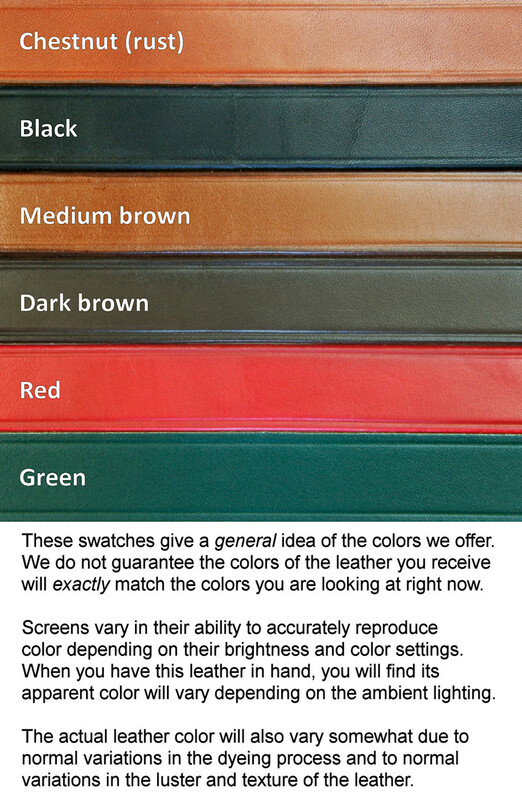 The decorative leather rosette behind the bell comes in a variety of accent colors -- see the current list below. Overall length is about 4 1/2 inches.